PRODUCING EXTREMELY HIGH QUALITY THREE DIMENSIONAL FABRICATED LETTERING, INTERNALLY ILLUMINATED USING THE LATEST LED LIGHTING. VISUALLY STUNNING CUSTOM SIGNAGE THAT GIVES YOU THE COMPETITIVE EDGE. 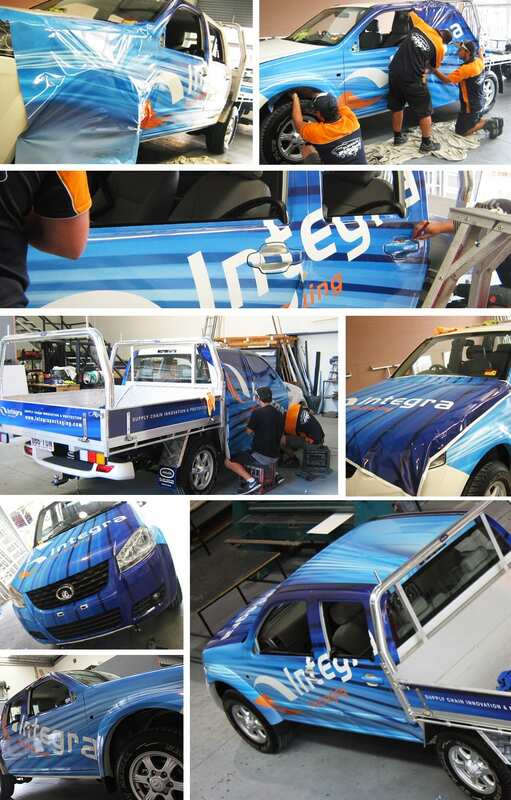 TO DESIGN AND VEHICLE WRAP 2 UTES COMPLETELY INCLUDING THE TRAY SIDES. 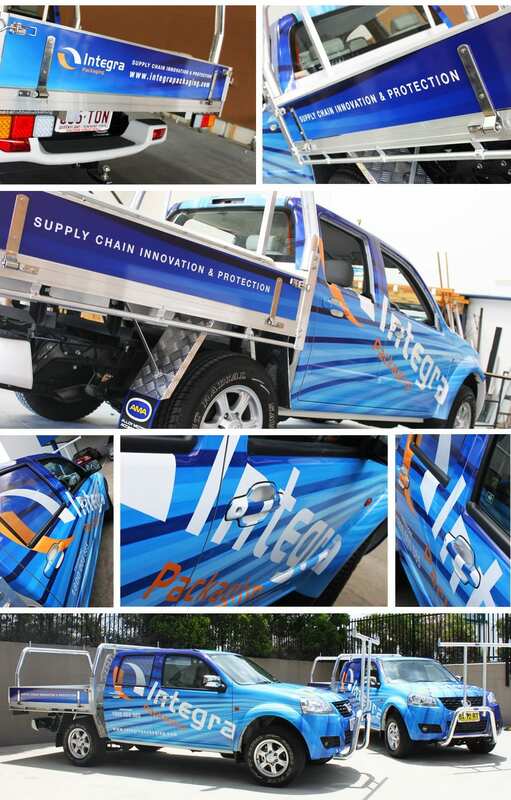 From an initial concept drawing, we took on the project of designing, manufacturing & installing a pylon sign for Zupp Property Group at their Helensvale head office. The sign was 7.2m high and 2.1m wide. The framework is welded steel and is set in an engineered concrete footing. Folded alupanel boxes on 25mm aluminium frames are secured to the steel structure. Between these boxes there are transparent blue acrylic strips backlit with LEDs. The top section has a fabricated acrylic “Z” with blue translucent vinyl applied to the face and is internally lit with LEDs. The “Zupp Property Group” is 50mm black acrylic letters, pushed out and backlit with an illuminated halo effect. The middle section is for tenancy signage. The bottom section features black 50mm acrylic letters, pushed out and backlit with an illuminated halo effect. INTEGRA PACKAGING – SUPPLY CHAIN INNOVATION AND PROTECTION. Integra Packaging creates cost effective solutions to protect and enhance our customers’ products throughout the supply chain. We provide a consulting and design service to identify cost-take-out opportunities and use our global network to offer world’s best practice in packaging innovation. We have specialized on-site teams to provide packing and preservation services around the world.